Here’s everything you need to know about metal roofing to determine if it’s the right choice for your home or business! Most people think about asphalt shingle roofs when they are ready for re-roofing their home. In Buckeye, many home owners also think about tile roofing, which is popular for its look as well as its durability in the climate that gets extreme temperatures and extreme storms. However, metal roofing offers many benefits for Buckeye home owners and businesses, as well. The most easily recognizable type of metal roofing is composed of vertical seam panels. The panels have evenly spaced ribs that run from the eave of the roof to the ridge. The panels are connected to each other and the roof by fasteners at the seams. Modular press-formed panels can also be fastened to the decking material or can be combined with hidden fasteners. These panels are pre-painted, and they can be designed to look like shake, tile, slate or shingles even though they are made of steel, copper, aluminum, zinc or terne. Some modular press-formed panels can also be granular coated and cut into smaller sizes to look like shingle and other types of roofing material. The cost of metal roofing depends on the material used, the size of the roof, and the complexity of the re-roofing job. Your exact location will also influence the cost of the roof. Some average costs for a seam metal roof vary from $7.95 per square foot to $13.35. The cost of a metal roof is much higher than that of a shingle roof, but a metal roof also offers many more benefits, including a longer life span and more energy efficiency. Metal roofing is well worth the cost when you consider its life span. On average, a metal roof can last between 40 and 70 years, compared with about 12 to 20 years for a typical asphalt roof. The exact life span of the metal roof depends on the material used, the quality of the workmanship performed to install it, and how well you maintain it. As mentioned above, one of the biggest advantages of a metal roof is its longer life span. Metal roofing is also more durable than asphalt roofing because it does not deteriorate as quickly and it is not as vulnerable to temperature extremes or storms. You won’t spend as much money on maintenance or Buckeye roof repair services with a metal roof. Metal roofing is also more energy efficient than many other popular types of roofing, helping you to save money. Metal roofing is also water-tight, lightweight, and can be installed on a variety of roofing types. Of course, you will need an experienced Buckeye roofing contractor for the installation of your metal roof. The disadvantage of metal roofing is the higher cost, though the cost is well worth it in the long run. Metal roofs also make more noise when they are hit with rain or hail, which some home owners can find off putting. Hail and falling debris can also easily dent the roof. 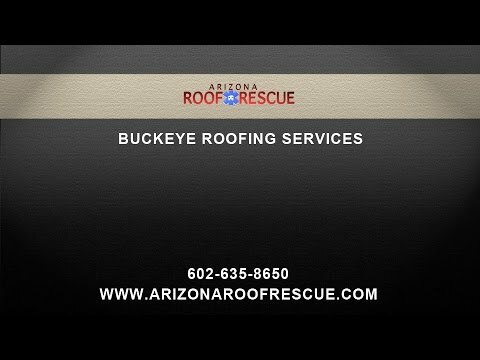 Arizona Roof Rescue can help you decide if a metal roof is right for your re-roofing project. One of our roofers will evaluate your property and let you know what advantage metal roofing can offer compared to other roofing types. Call us today to learn more about your options and find the best roofing material to protect your property and meet your budget.